Mark Braby and Shaun Hendry present the latest in an ongoing series of genuinely alternative after-office live entertainments. Admission is free to members (show your membership card) otherwise sign in for membership. Donations, to the performers, will be sought. Gagarin – Gagarin is the solo project of Graham ‘Dids’ Dowdall who has been active in the outer reaches of the musical universe for many years working with , amongst others Nico, John Cale and Pere Ubu. As Gagarin he makes instrumental electronica – at times urban and beaty, at others atmospheric and melodic – always with a very personal experimental twist. Skopje – Dark ethereal folk….tales for the depraved and departed….prepare to be entertained……sadistically. Now – NOW will perform a 15 minute instrumental Motorik. A Motorik is a genre based around the repetitive drumbeat originated by Moe Tucker (The Velvet Underground), Jaki Lieberzeit (Can) & Klaus Dinger (Neu!/La Dusseldorf), who called it “The Apache Beat”. The rhythm is usually accompanied by simple melody motifs & minimal, or no, chord changes. Jude Cowan – what news?? well, if anything interesting’s been happening Jude shall be sure to know, and sure to tell… so be sure to listen!! Horse Trio – The Horse Trio plays a uniquely textured brand of improvised music- moving air through tubes, reeds and bellows. Hutch Demouilpied – Trumpet, Sue Lynch – Saxophone and Flute, and Richard Sanderson – Melodeon. 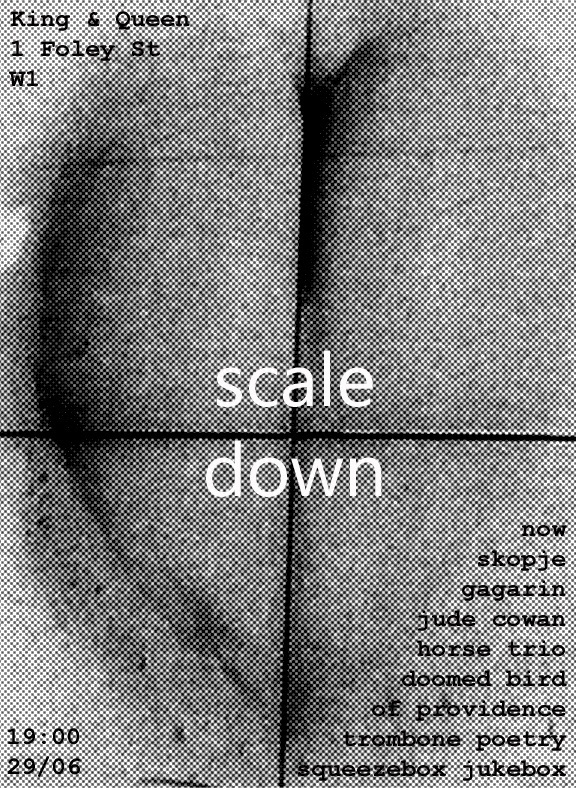 For this Scaledown performance The Horse Trio will play acoustically. The Doomed Bird Of Providence – The Doomed Bird of Providence are a dark folk group currently residing in London and Colchester. Led by Australian singer/accordionist Mark Kluzek, the band explore darker aspects of Australia’s colonial history. Squeezebox Jukebox – Squeezebox Jukebox is a ‘dysfunctional and evolving concerto for accordion and updated barrel organ’. Enjoy maestro Matt Smith as he wheezes and squeezes. Trombone Poetry – Mr Paul Taylor blows and spouts beautifully and eloquently. Savour fifteen minutes of verse and brass.